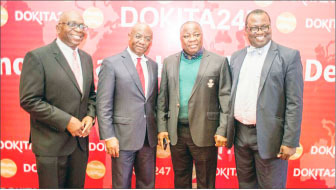 To improve healthcare services, a lifestyle company has unveiled a telemedicine app, dokita247.com in Lagos recently. The app, which is expected to be freely available for every smart phone user in the country will reduce medical tourism, minimise consultation and treatment time between physicians and patients. Announcing this during its launch, Dr. Richard Afonja, the app developer, said the platform can be downloaded on google play store and apple store with any smart phone. Afonja added that there exist real, verified, credentialed and vetted physicians waiting to respond to all health diagnosis and treatment enquiries by patients using the app. “The app is presently being used in in the United States. By January 2018 it will be in effect in Nigeria, and we hope to spread this to other African countries very soon. “Using the app may extend the lifespan of Nigerians as they can seat in the comfort of their home and office for the consultation, laboratory tests and drug prescriptions,” the Founder who is also a US based medical expert said. On his part, Dr. Francis Faduyile, the key note speaker, said such telemedicine can change the face of healthcare in Nigeria as it can be both beneficial for patients and he healthcare providers. For the providers, this can aid in reviewing patient information, provide medical advice, connect to the facility’s electronic health record and manage clinical messages among others. The patients can use it to view, schedule and make appointments using web portals, view medical information from the Internet, find healthcare providers, and find pharmacies. The new technologies will allow remote monitoring of patients and their access to healthcare, health data collection, patient identification, medicine administration, medication compliance, information exchange with the providers and other patients. It will also allow access to medical record, among several other benefits that would continue to accrue with the fast pace development of medical and allied health technologies. Similarly, Mr. Silva Umukoro, Chief Financial Officer, Dokita247 also noted that telemedicine will bridge the gap between doctors and patients as well as reduce healthcare challenges bedeviling Nigeria and Africa as whole.